Terminus Audio continues to sample its versatile and quality international flavor and this installment of the catalog is no exception. There is a time and place everything, and not all records are intended to be in-your-face bangers - some are a little more subtle in their approach and execution and merit listening to outside of the club. Enter the newest Terminus artist (who has several more released tracks to his credit) CH'AB's "Dust EP". This is a concept EP that Jason Mills instantly gravitated to when they arrived in his inbox; and it has been waiting for its release since. Dark, catchy and full of interesting sounds and textures - each of these tracks compliment one another and fit together like the pieces of a puzzle. 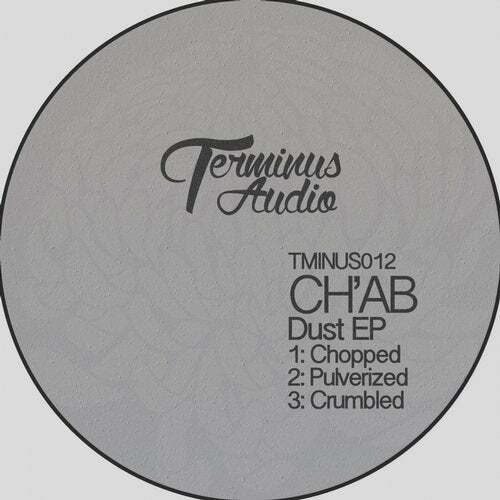 Chopped, Pulverized and Crumbled comprise the Dust EP from Italian artist CH'AB. Starting things off and setting the tone at 124 beats-per-minute is "Chopped". Classic stabs and an arpeggiated synth; along with spaced out effects and minimal 16th-note hi-hat runs join an ominous bass line - all gradually building throughout the six and a half minute song. There is no wasted space in this track, and the arrangement flows nicely; making it easy to get lost in. Definitely something fresh and understated for sets or casual listening. Good work. Next, the pace picks up a few notches with "Pulverized". CH'AB delves into slightly darker territory with this track, using a simple but highly effective bass pattern as the foundation to build from. Similar in sound and scope to the previous title; bugged-out effects and a nice rolling snare drum keep things interesting. More quality here from CH'AB. Another unique, catchy piece of music. Rounding off the "Dust EP" is "Crumbled". With a slower tempo once again - a persisting, pulse-like synth sound carries the track forward; underpinned by soaked filtered drums and highlighted with unorthodox SFX. This track is minimal and quite experimental, a must listen for those looking for something out-of-the-norm. As with the other tracks, "Crumbled" has an eerie, hypnotic and unusual atmosphere and is a fitting final track to the EP. We look forward to hearing more work from the Italian artist CH'AB and are proud of this entry into the expanding Terminus Audio catalog. Where will we find ourselves on the globe next?